On captain Danny Carter’s final home game at Rivermead on Sunday afternoon, before retiring after some 18 years’ service to Rockets, he shone brightly as he scored 21 points and made 8 assists. Though Mother’s Day, an appreciative crowd turned up to say a hearfelt thank you to the lionheart of the team for this long period of service . Carter was in majestic form as he poured in 12 pts., in the opening quarter with A J Carr adding 11 pts. as Rockets took control of the game at 30-16. They added a further 29 pts., in the second period to enjoy a 59-39 lead at the interval with Carter having 19 personal points. 17 yo Academy player Sam Grant hit 7 personal points during this time as Trae Pemberton found his treble range and Sydney Donaldson provided the drive energy. Tanner Kuehn made a block and scored to see Rockets 23 points up midway through the period though a buzzer beating treble from Magic reduced the deficit to 20pts at 59-39. The third quarter was highlighted by a huge treble from Adrian O’Sullivan from inside his own half but there was a back court violation so it didn’t count but was a magnificent shot. Rockets were dominant in the paint and scored 19 pts., from turnovers as well as 19 pts., from fast breaks, much to the delight of Rockets supporters. Magic had opened the scoring but that was the only time they led throughout the contest as Head Coach Alan Keane saw six of his players reach double digit scores. The low scoring third period saw Magic take it 21-14 as Jonathan Barnes continued his impressive contribution for Magic though Rockets still enjoyed a 73-60 advantage going into the final stanza. This was highlighted by Rockets last signing before the January deadline, Kuehn stroking three trebles in the last quarter. 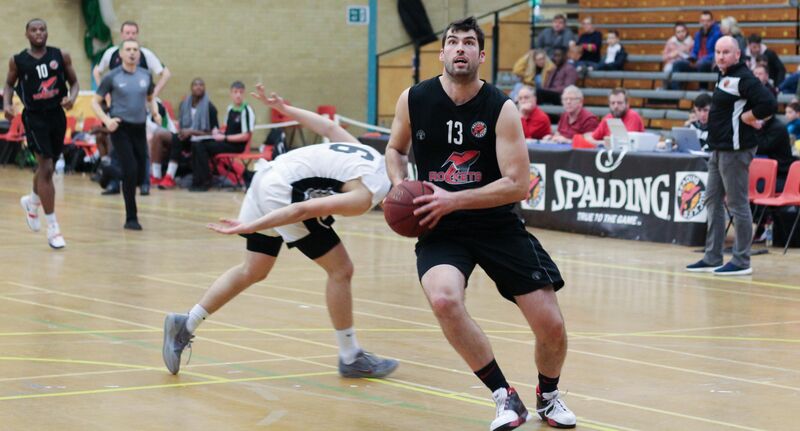 O’Sullivan wanted to join the party too with Rockets fourth three of the period as they saw out the game 95-85. Coach Keane was pleased to see thirty points from his bench as well as 24 assists and ten steals of which Rockets two big men were the most prominent. Donaldson retrieved a Rockets turn-over with a great interception as Magic fought tirelessly to get close to the hosts but Rockets experience and determination to make this a real day to remember for their retiring captain, saw them take the victory. Rockets now look forward to the Play-off Championship which starts next weekend with them travelling to Loughborough for the quarter final stage. Top scorers for Rockets were Danny Carter with 21 pts., 4 rebounds and 8 assists; A J Carr with 19 pts and 9 rebounds; Sydney Donaldson with 13 pts.,6 rebounds and 6 assists together with Tanner Kuehn also scoring 13 pts and 6 rebounds. Adrian O’Sullivan and Trae Pemberton had double digit scores with Pemberton taking down 5 rebounds and having 3 assists.